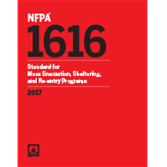 Based on NFPA 1600, all-new NFPA 1616: Standard on Mass Evacuation, Sheltering, and Re-entry Programs provides requirements and resources for disaster planning and preparedness. Essential for shelter managers, emergency managers, and other community officials charged with developing and implementing emergency management plans, NFPA 1616: Standard on Mass Evacuation, Sheltering, and Re-entry Programs establishes a common set of criteria for the process of organizing, planning, implementing, and evaluating a program for mass evacuation, sheltering, and re-entry. The program is scalable to meet the needs of evacuation sheltering and re-entry. Annexes address issues central to preparedness, making this first-edition Standard a rich resource. 5.5 Threat, Hazard Identification, and Risk Assessment. 5.8 Communications and Public Information. 5.9 Warning, Notifications, and Communications. 7.2 Goals of the Curriculum. 7.3 Scope and Frequency of Instruction. 7.5 Regulatory and Program Requirements.